Delivering Marketing Joy is one of the pieces of content that I am most proud. Why? Probably because it was one of the first consistent pieces I produced…and it helped put me on the map. Now, nearly 200 episodes later, it’s still rolling. As you might expect from a journey like this, I have learned a lot from Delivering Marketing Joy. But what can it teach you? Here are a few lessons I am proud to share. Don’t Listen To The Voice: I have talked about this before here, but it’s worth mentioning again. The hardest voice to overcome when starting something like this is the one in your own head. For Delivering Marketing Joy, I had to overcome the voice telling me that no one wanted to talk to me on an interview show. Who was I? I am so glad I pushed through that. Most people were more than willing (and generous) to spend the time. Share Platforms: One of the reasons I think the show worked (early on) was because I was sharing platforms with other people in the industry as I grew my own. In my first episode I talked with Mark Graham. He was already an influencer in the industry, so I was able to leverage his audience too! Obviously, the goal is to provide value. So by sharing platforms you get to share the goods with more people. Stay With It: When I was about 20 or so episodes into the show, I was kind of tired. I was proud of how many shows I had done…but I did not know whether it was worth it to continue. Insert Seth Godin. I got the chance to interview him (with Mark Graham) and Seth mentioned that he had seen the show! Wow! Then he said something I will never forget. “Stick with it. In 3 years you will be glad you did.” At the time I did not have the next episode lined up! But I did keep it up. And Seth even agreed to be my guest when I got to Episode 100. Watch that here. Be Consistent: This is something I preach a lot…because I think it really matters. If you want to build an audience (and I am still working on it), you need to be consistent. It’s important to the audience. But I think it’s important to you too. It sets a deadline. Otherwise, it becomes really easy to “just miss one.” Start With A Few in the Bank: This leads nicely to Start with a few “in the bank.” When I started DMJ, I heard that the average web show never makes it to Episode 5. I have no idea if that was true. But I was obsessed with starting with 5 shows done! That bank of episodes gave me some confidence and gave me time to get more going! Don’t Worry About the Metrics (at first): It’s not about creating a “viral video.” It’s about creating value. Way too many people get really focused on the numbers too early on. It’s a recipe for frustration. You are (likely) not going to have a big audience at first…so the numbers are not going to be impressive. That’s fine. It will build. Plus, I have found that despite the numbers, you never know who is watching. Keep focusing on the value…the numbers will take care of themselves. 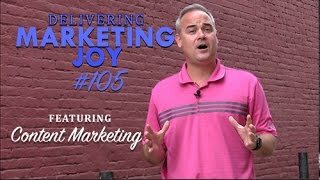 Delivering Marketing Joy is a weekly class for me (and this week was no different). I learn something all the time. But these are just a few lessons that I am reminded of as I look back. Want to keep up with all of the lessons? Sign up for our VIP newsletter. It’s a great way to stay on top of the content we are creating!